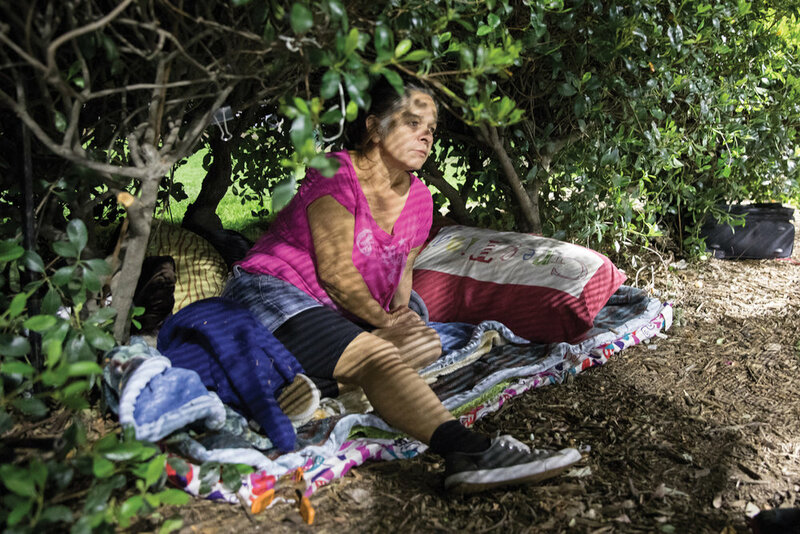 CSUN photojournalism students capture scenes of encampments and activities. 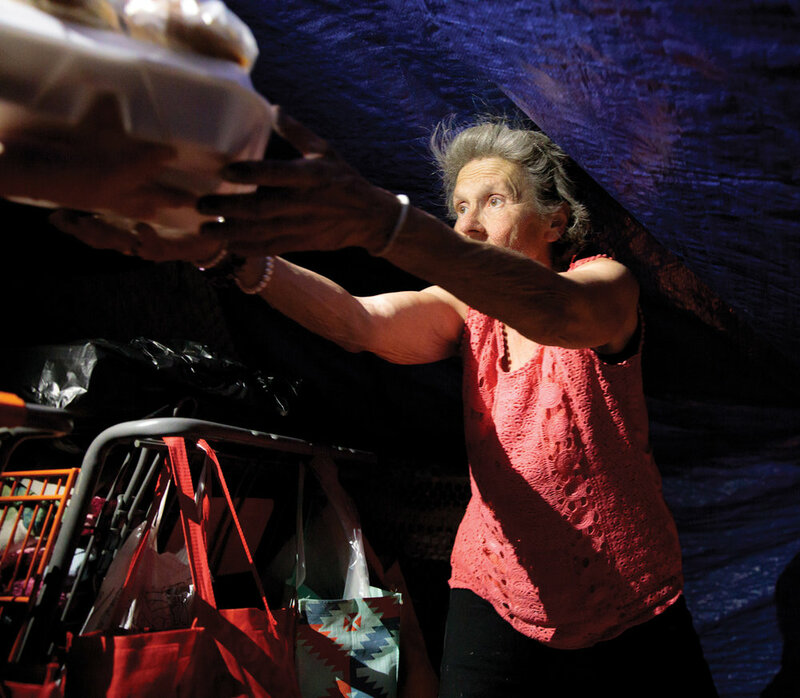 North Valley Caring Services (NVCS) Wednesday Night Outreach, led by Community Liaison Manuel Flores, distributes food to the homeless in an effort to establish relationships. The program serves people living in encampments and transitional housing. Flores sees those who live in tents and bushes that do not seek assistance as the most critical to help. The goal is to refer them to housing programs, medical facilities or drug rehabilitation centers and ultimately get them off the streets. Often it starts by inviting them for a shower at NVCS. Photos © copyright 2017 by Max Sullivan. Shopping cart by Keila Vizcarra. This is home: a shopping cart and personal items under a makeshift tent. Manuel Flores distributes food on Sepulveda Boulevard and Rayen. Lynda receives a meal from NVCS inside her tent. Lynda uses candles to light her tent. On the mattress is a bag of her abstract art painted with nail polish on canvas. Laura used to live in an RV, but now she sleeps on the sidewalk in front of the Ralphs on Topanga Canyon just south of Roscoe Boulevard. Eva sleeps in the bushes in the Sepulveda Recreation Center. Tents are not allowed. Brian says he loves the freedom of being outside and riding his bicycle. One of the critical factors directly related to immediate homelessness is a severe shortage of affordable housing. Homelessness carries risks of death and bodily injury from the natural elements, violence, and increased health risks caused or worsened by the lack of shelter. There are fewer shelter beds than homeless people in many American cities. It is estimated that 77% of the city homeless population are without shelter beds. The U.S. Department of Housing and Urban Development (HUD) released a report stating that Los Angeles has more chronically homeless people than any other city. Chronic homelessness is defined as long-term or repeated homelessness coupled with a disability. 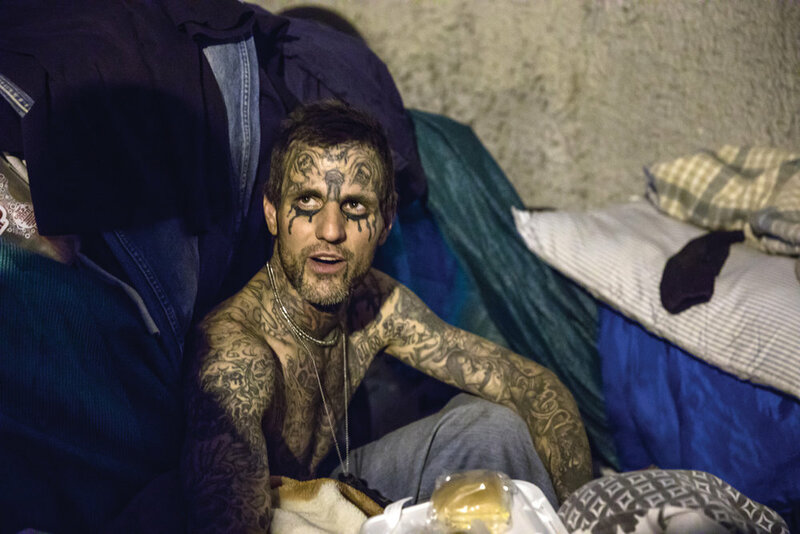 The homeless population in California has risen by 6% from 2015 to 2016, and in the San Fernando Valley by a whopping 35%. There are many aspects to homelessness that require a multitude of solutions. One of the steps we can take is to educate ourselves and help dispel the stereotype of what it means to be homeless. People who are homeless are still human, and should still be seen and treated as such.